Enjoy the villa even in winter, with many activities for the whole family! 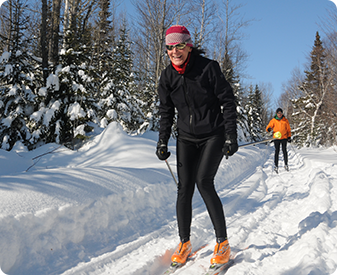 Start the day right skiing, snowboarding or snowshoeing. Then, relax in the spa before enjoying a nice dinner in the city. 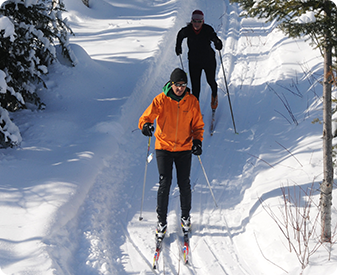 Between the river and the mountain, the cross-country skiing trails offer majestic scenery and refuges equipped with wood stoves where you can warm up. Le Massif is one of Quebec’s most beautiful ski resorts. It annually gets an average of five meters of snow, has 48 slopes and has the highest skiable altitude difference east of the Rockies. 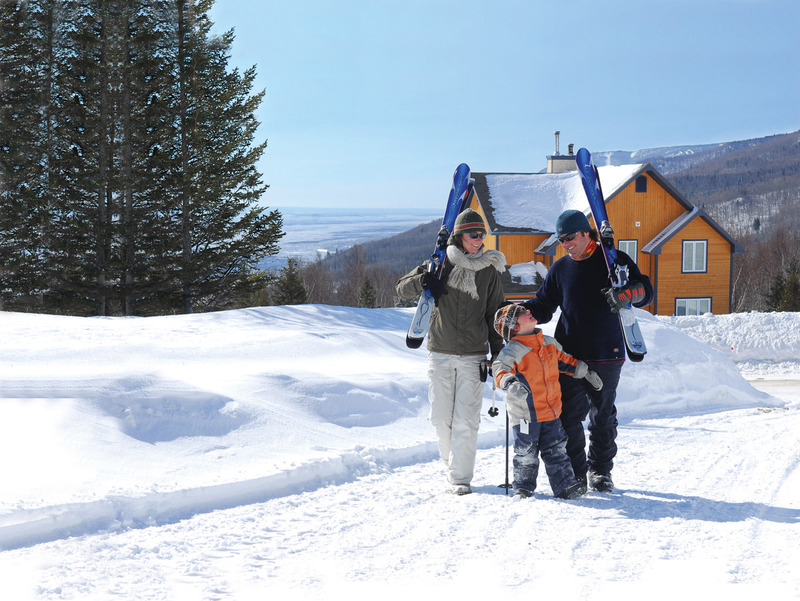 Le Versant Charlevoix is a five-minute drive from le Massif and offers a daily shuttle service in the winter. 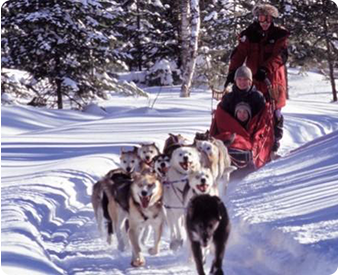 Quebec is, without a doubt, the snowmobile capital of the world, with its 33,000 km of federated trails. Let Charlevoix be your playground and discover this fascinating sport. A guide will take you on a two-to-eight-hour snowmobile ride where everything will be taken cared of. To make this experience as pleasant as possible, each activity is personalized depending on the weather and experience of each participant. 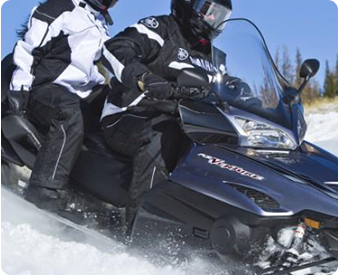 You can also rent a snowmobile in Baie-Saint-Paul (10 min), with or without a guide and equipment. Come enjoy the ice bar, music, light display and heated terrace at Le Versant’s snow fort. Did you know that the movie “The Dog Who Stopped the War” (“La Guerre des Tuques”) was shot in Charlevoix? 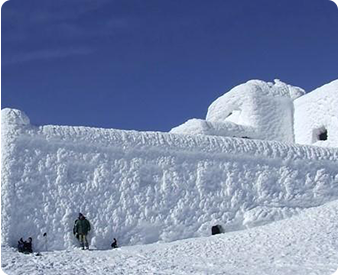 Bring back childhood memories by visiting Le Versant’s snow fort. Located at the reception area, between the pool and the ice rinks, the snow fort is definitely the most unique place to socialize. After a long day outside, enjoy a good cup of hot chocolate or a glass of hot wine. Call a truce and have some fun! Right in front of your chalet! We offer 20 km of trails, where you can enjoy the forest and splendid scenery of the Saint Lawrence River and the mountains. You can choose your own route. Whether you are a beginner or an expert, or you want to take on a 30-minute or three-hour hike, our staff is there to help you and give you tips. Before heading back, take a few minutes to enjoy the Prairies area. It’s a very peaceful and unique place with a breathtaking landscape. Soak in the sun while observing the tide’s impact on the glaciers and the boats that travel the Chenaille du nord. Don’t forget your camera! You won’t want to leave without a few photos. Le Manoir Du Temps Suspendu is a prestige holiday villa available to rent year-round. It is located just a few minutes from Le Massif de Charlevoix and less than 15 minutes from Baie-Saint-Paul, one of Quebec’s most popular tourist destinations.